You are here: Home > T-Mobile Adding Data Plan To New Data Lineup? T-Mobile Adding Data Plan To New Data Lineup? After some apparent confusion regarding the delay of the 200MB data plan set to launch tomorrow for T-Mobile, they have readied a second plan to launch November 14th along with it. The $15 200MB plan will NOT require a contract extension and can be added to any existing rate plan. I’m a little curious by the line that says, “New even more promotional plans will launch to support this new feature…” Are we to expect some revamping of the current T-Mobile rate plans in the coming weeks or am I reading that incorrectly. Unfortunately there is no indication here of a backtrack of the current plan to charge $15 for tethering which has seen quite a bit of customer backlash. While there is certainly an argument to be made for both charging for tethering and not, T-Mobile hasn’t indicated a shift in position. At the very least, they are listening to their customers regarding the $10 200MB plan by coming out with a second, no contract offering. This means that those of us with Smartphones that who live with a wi-fi signal most of the time can get by a lot less expensively than before! That’s because the blackberry data soc was always compatible between the other devices. Take your sim out of a blackberry and put it in an android and it just works. Uh, that’s not accurate. Blackberry does require a different SOC because it needs to provisioned for Blackberry data services through RIM servers. No RIM server, no service books, host routing table, etc. Data may work for a little bit, but that’s until the provisioning is reset, which is automated. Why are the ones that were already grandfathered in with T-Zones getting the shaft? I can’t utilize any of the new smartphones with the T-Zones internet. Only option is to try to purchase an unbranded phone. Sounds good…just double my cap. Let me be the first to say the crackdown on first comments is great. Huh?! Now I’m confused! I’m a Even More Plus subscriber, so how can I get the $10 option? So does that mean I can upgrade to a subsidized G2 with a $10/month data plan? it says all phones qualify…so I would say yes. The $15 one is for non-contract upgrades. G2 requires web so it’ll have the $10 because an upgrade will be a 2-year extension. From the current posters in store, the only smart phones that will let you do the $10 web is the Charm, LG Optimus T, Moto Defy, Comet, Garminfone and Nokia E73, none others that I can think of. i wonder why they would say any phone qualifies…if only certain phones qualify?! I’d say the current posters are now wrong. Since this says clearly “any phone” I’d think they would be risking legal action if they tried that. What crap. A two year contract is required for adding a data plan? And tethering has always been free, and now they want me to pay for it? And they lowered my data cap from 10GB to 5GB? When I bought my G1, that I am still under contract for, they said tethering would be allowed and I had 10GB before I was slowed, now they raise the price and lower service. If I get 5GB of data why do they care how I use it? Oh, that’s right, they want me to pay for it but not use it. tethering still is free.. there are alternatives.. and i have unlimited data (no throttling or overage) using my grandfathered $5.99 t-zones. I also have the T-Zones for $5.99 grandfathered in, but I wish they would allow us to utilize BIS so that we can use Blackberry devises under T-Zones. I still think that those of us who are Grandfathered in are getting the short end because we can’t utilize the newer handsets without having a prompt asking us to upgrade our internet package. Someone please plead our case to corporate. The people have spoken! What does the last to sentences read in the ad ? Nevermind, i can see it now. So confused..can I put the $15/200MB on my wife’s Touch Pro 2 or not??? it looks like you can since all phones qualify. TMONEWS keep bringing us da scoop. great job!! Is this real? I asked some guy who works for Tmobile and he said he doesnt hear anything about this. I’ll assume by your post you are a new reader, yes it’s real. We only post real. We usually get info before most employees are aware of the changes forthcoming. It’s real. My guess is, T-Mo will have one set of rate plans and will do away with the EM or EM+ pricing. About time the big pink (magenta, legally) stepped up it’s game! Need wifi for the ipad.. And probably ill get an android tablet too..
Yeah, that EM and EM+ rate plans help others, but they are confusing. The bad thing about EM+, is that once you change over to the EM+, you are stuck there, with no way to back track. I am eager to see what they come out with. Now i am thoroughly confused. I know tmo reps in stores and some tmo reps on phone are not always well informed but this lady on phone just confused me a lot. I am planning to buy a MT4G with $25 data plan (customer loyalty). Until this part everything was ok, but i wanted to upgrade the second line too with $10/200Mb plan which she said I cannot, i need to take $15/200Mb plan (since $10 plan is for non-contracted users). She also limited the numbers of options in the phones which i could buy with this plan. She said data-phones wont be eligible. Its only phones like LG sentio, gravity and nuron and all those…not even comet,defy or charm. (I thought i saw some post here about some poster in a store abt these phones being eligible). Well…i guess i will hv to try another time on phone :( … hope i can atleast take DEFY. Maybe because currently the 200mb plan isn’t available yet? When the 200mb plan becomes available, the $25 unlimited plan is no longer available according to the literature we saw originally. It sounds like she’s talking about what she can sell you now, not what she can sell you when the new plans come out, even if she uses the term of “200 mb plan”. If stores have posters up about the new data plans it’s because they did it WRONG I just did our changeout and we got an email from corporate saying to keep all brochures and posters that referenced the new data plans in the back until further notice. We haven’t gotten any information about what they are going to do at the store level, not officially through channels. Originally the idea was that “premium smartphones” like the MyTouch 4G and G2 and all of the BlackBerry line couldn’t use the 200mb plan but that has not been communicated one way or another since the rollout was postponed. Doesn’t anyone think that 200 mb is just too small an amount of internet? As far as t-zones: it was always a phone first internet option, never intended for smartphones. It doesn’t provide access to the full web. If you have a feature/phone first phone and t-zones feature, currently it will work. I think that may be about to change. I’ve never seen Blackberry web service cost less than $20. The ones I feel bad for is those switching off of Sidekicks who had unlimited text and internet for $20. This email came in yesterday. Below is exactly what it said. 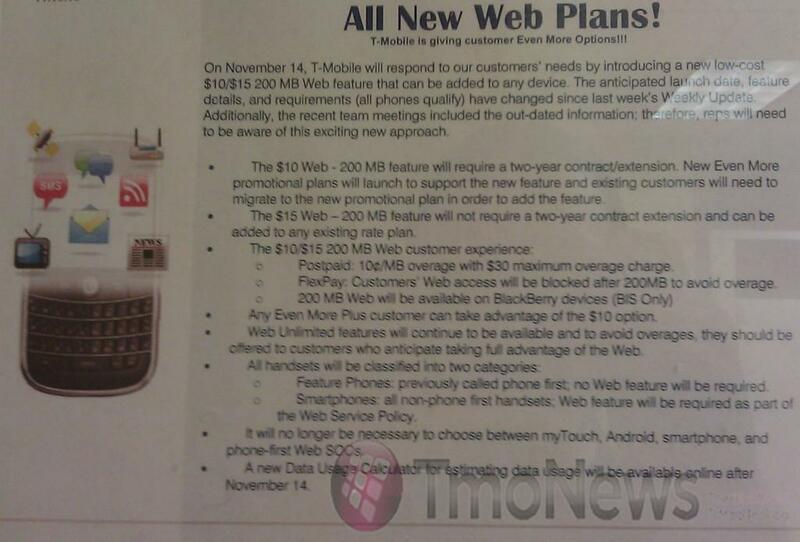 To bring the benefits of Web access to more customers and families, T-Mobile will introduce affordable $10/$15 200 MB Web features on November 14. NO CONTRACT plan you pay $10. CONTRACT plan you will pay $15. NO CONTRACT plan you pay $25. CONTRACT plan you will pay $30. So wait we actually get a better deal if we don’t have a contract??? Why not? We get screwed with crappy upgrade deals in exchange for a 2 year contract, so why not a more expensive data plan? As data networks become faster and faster and data downloads increase doesn’t it strike everybody that data is being capped at “x” amount of data usage and at what point do we look at AT&T’s model and really ask ourselves where’s the line in the sand going to be drawn this time next year?